In the late afternoon, on the floor of the long room, stripes of light from the windows cross beams as thick as barn rafters. Wooden railroad ties lie in a long, curved line, as though they hold an invisible a track. 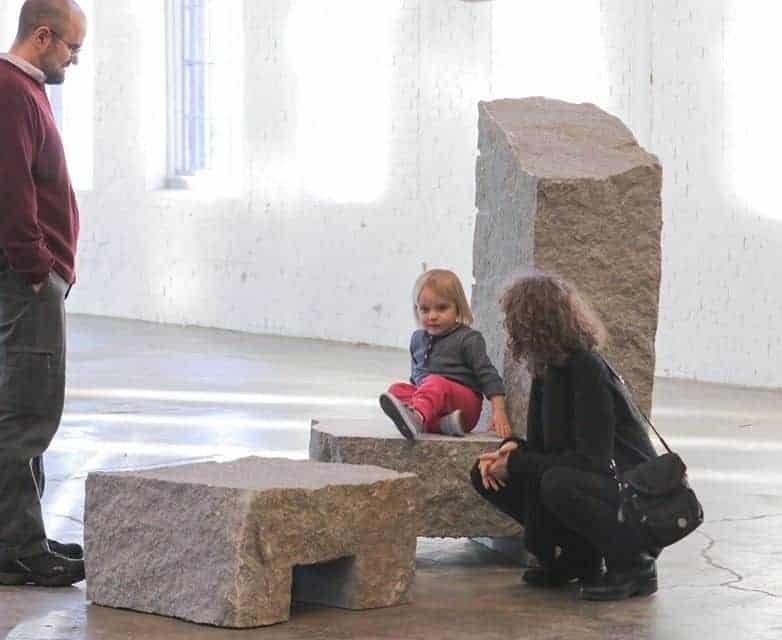 Richard Nonas looks out across his sculpture in “The Man in the Empty Space,” newly opened in Building 5 at Mass MoCA in North Adams. People are sitting on stone blocks and pausing by wooden stairs that climb the wall. The brick above them shows the marks of time and wear and paint from long-gone hallways. “It’s an incredible room,” he says. It holds history: an industrial space, a part of the force that built the town and kept it going for 200 years and then shut down. The reverberation of people in a place matters to Nonas. He began as an anthropologist and spent 10 years in the field before he turned to art. He found that mountain people and valley people talked about the world differently. Living in in the mid-west with a 360-degree view or in the hills with ridge lines in all directions could shape ways of seeing and understanding. Coming up here from New York City, he was struck by the differences from one small town to another and the imprints of the past. And the room itself is beautiful. He works with materials people will find familiar, with little mystery. Here the chair-like stone blocks still show the mark of the drill. He cut them in a quarry in Sweden, he said, and they arrived the day before the opening. When he saw them brought in late at night, they were still near freezing. And they reshaped the room. He knew they were coming and planned for it, and yet when he brought them in he felt his sense of the place revolve, and not in any way he thought it would. 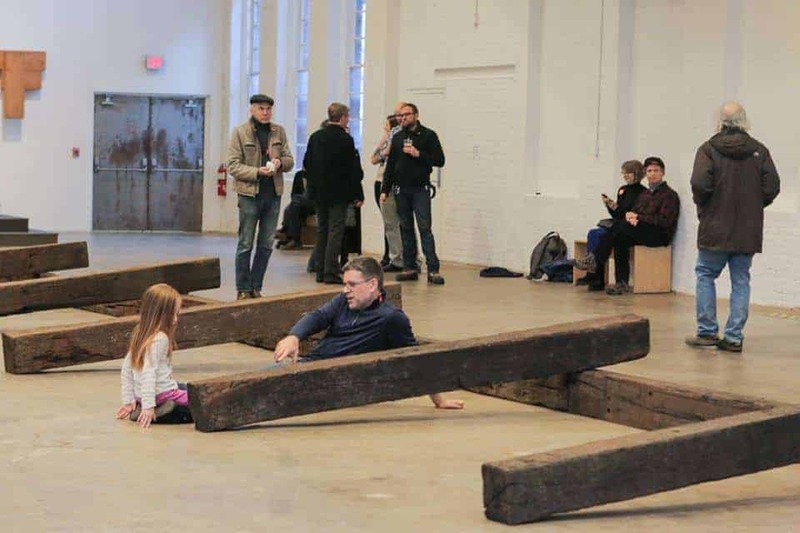 Curator Susan Cross first encountered Richard Nonas’ work in the mid-1990s, when she was curating work from the Panza collection at the Guggenheim, and she has found it powerful to bring him into this space today. As he planned the work, Nonas spent time in the gallery throughout the day, learning patterns of light that changed every 10 minutes. 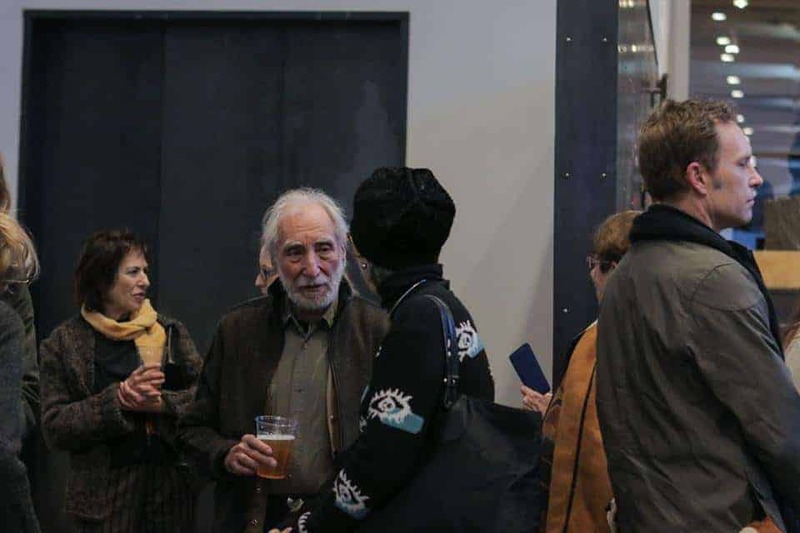 He looked out over the shapes of wood, metal and stone as people moved from one to another and stopped to touch or to look closely at an element of the room. He wants to skew the room, to make people pay attention, and he uses the placement of objects — giving them a visceral and physical feeling as they push against each other or pull away or draw the eye on past them. His objects draw force in relationship to each other. Walking through the galleries, he hopes, will feel like navigating a party, talking with one person, then another. Cross has felt that energy. He has had the same feeling walking into an opening in the forest, or into a cathedral. “That sense of how much the place in which one is living changes the way you read that place, everything in it, how we deal with each other and the possibility of an experience where even for a moment you feel the world differently and you remember it — maybe five times in my life it has happened to me in front of a piece of art,” he said.